You give everything, but you still can’t get your knee down on the ground?! 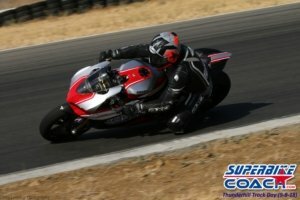 This is your opportunity to learn it with the Superbike-Coach! 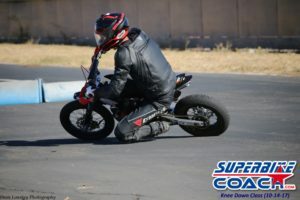 Knee dragging is the most exciting thing, and it gives you the self-confidence you are looking for. Don’t wait… we only have one Knee Down event per year! Don’t think it is just a question about the “right” equipment… it isn’t. Actually, it’s possible with nearly every motorcycle. Where do you want to learn it? 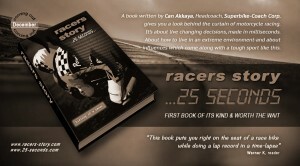 Alone on a race track, just to find out that you feel scared, too fast, and lost in between faster bikes and riders? Or on the road, where it is too dangerous, and tight? No… you need a safe environment, lot’s of like-minded riders around you, and a Coach who knows what he is talking about. Ability to learn on your own bike and on our easy to handle bike. 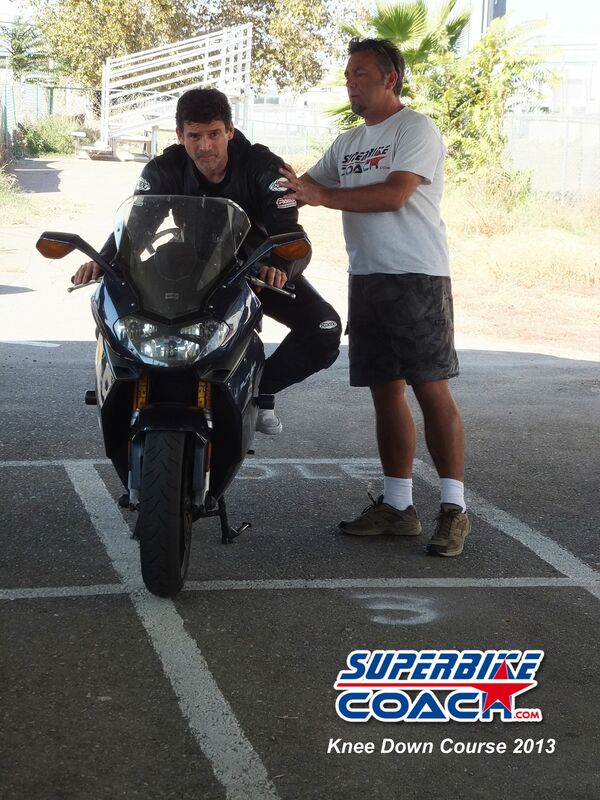 Your Superbike-Coach Knee Down class starts at 10:00am to an estimated end time of about 4:00pm. You will learn useful drills out of Racing and tons of information on our small race track. We show you the lines through the turns and visioning the way. Body positioning and how to use physical aspects to your advantage doing Hanging-Off. The training is very effective and will increase your confidence, awareness of road and environment conditions, and personal and bike control. With all of this, and the continuous personal attention you’ll receive from your coach… you’ll drag knee. Superbike-Coach wants to make sure that you have an unforgettable experience. So as good as we can, we take pictures and high definition videos of you dragging the knee, which you will get for a FREE download. Our mini-bike is ready for it. For people with a long travel- or don’t want to use the own bike- we have a rental knee bike for only $190. Most riders, especially from far away, are also taking the Wheelie Course the day after the knee down class. Just add this option in the booking process. Both, the Knee Down and the Wheelie Course the next day are always quickly booked out. You better make plans and a booking pretty soon! We can help you out. Rent one of our pool bikes which are coming with gas, race tires, and transport. The fee is $190. A optional damage protection plan of about $85 (covers you to max $700 in damage, no matter how bad it is). Of course you can bring a cheaper 3rd party rental, but you won’t have that insurance, and no transportation to our track. Just opt it in the booking process. 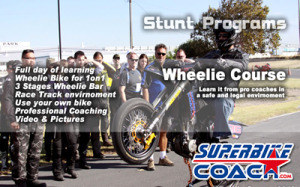 Extend your learning journey with Superbike-Coach and learn how to do wheelies the next day. Just opt it in your booking process for the knee down class. Entrant discretion is advise: Our classes are taught up front, honest, and possibly ‘in your face’ approach. We try as much as we can, however, some of the language used could be ‘uncomfortable or offensive’ to some. Also, hard as criticism may be given, praise is just as quick and powerful. We believe you deserve a very honest approach and every word said is ‘from the heart’ to help improve and motivate. If you feel this is too harsh, then this program might be not a match for you.